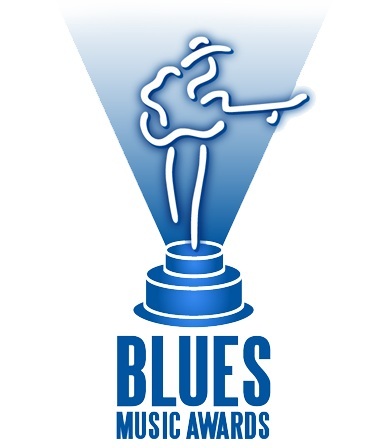 The 34th Blues Music Awards will be Thursday May 9, 2013 at the Cook Convention Center in Memphis, Tennessee. The 2013 show will follow the format of the critically-acclaimed shows of recent years. Close to 100 nominees attend and the night is filled with their appearances and performances in a cabaret/dinner setting in the Convention Center’s ballroom. Each year, the Foundation presents The Blues Music Awards to the artists selected by its members. They are universally recognized as the highest honor given to Blues artists. The event brings together Blues performers, industry representatives and fans from all over the world to celebrate the best in Blues recordings and performances from the previous year. Joe is nominated for: The Gibson Guitar Award “Best Guitarist”. Joe’s CD: “Driving Towards the Daylight” is nominated for best Rock Blues Album. Joe’s DVD: “Live From the Beacon Theater” is nominated for DVD of the year. Just being nominated in these 3 categories is a tremendous achievement! 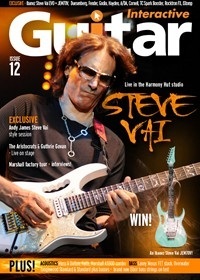 iGuitar Magazine Issue 12 – Steve Vai Special! 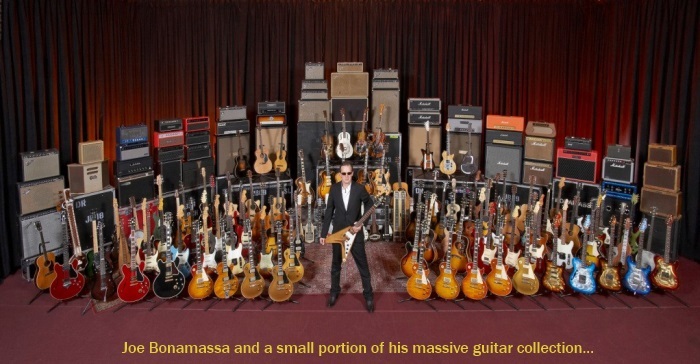 Inside “The Harmony Hut” Studio with Steve VaiSteve Vai invited iGuitar into his Harmony Hut Studio to talk about his brand new album “The Story Of Light” and show us his extensive guitar collection. The Aristocrats – Guthrie Govan’s SupergroupThe latest greatest Supergroup? iGuitar has world exclusive live footage of Guthrie Govan’s incredible band of all the talents. Levi Clay explains why The Aristocrats is the one band you don’t want to miss. 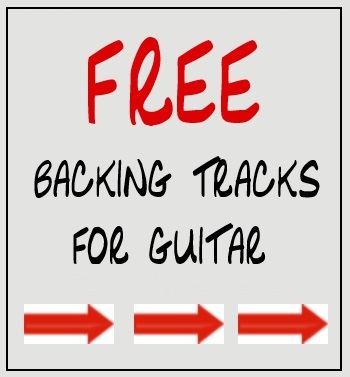 Tech Sessions Andy James – Steve Vai – Andy James delves into the secrets of the Steve Vai style and teaches you the licks and tricks of the master. Marshall 50th AnniversaryMarshall Amplification celebrates its 50th anniversary this year and iGuitar has a two-part celebration of the amp brand that gave Rock its voice. Ibanez Jem70V Competition!WIN an Ibanez Steve Vai JEM 70V in our amazing free-entry competition! Named for one of the industry’s most revered personalities, the Les Paul Award was created in 1991 to honor individuals or institutions that have set the highest standards of excellence in the creative application of recording technology. This year’s Les Paul Award recipient, Pete Townshend, has enjoyed one of the most intriguing, respected and multifaceted careers of any artist in the rock and roll era. The outline of his life in music is well-known. 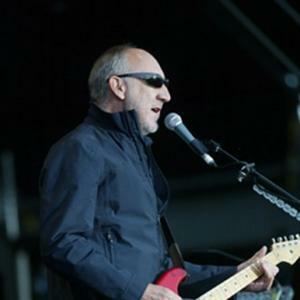 As the leader/guitarist/main songwriter for The Who for close to five decades now (with a few breaks), he has produced songs and albums that will endure long beyond our own lifetimes. The Who were the original mod band, coming onto the scene in the wake of The Beatles, and a true force of nature unlike any other group playing the clubs in England at the time. No other band boasted a drummer as explosive as Keith Moon, a bassist as inventive as John Entwistle, a singer with the pipes of Roger Daltrey or a guitarist and songwriter as vital and energetic as Pete. [CLICK HERE] to Read the rest of the Story. 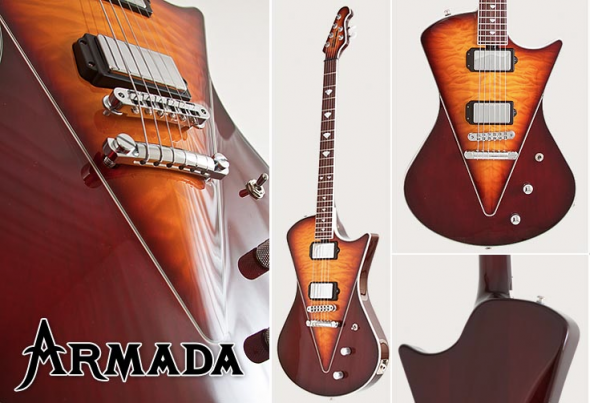 It’s going to be 106 degrees in Phoenix, Arizona today – home of the GuitarDaddy. (106°F = 41.11°C)… That’s pretty hot! So what’s a hot guitar player to do on a hot Arizona day? No, this is not my swimming pool — but I sure wish it was! This image has been floating around the internet for a while and I have been waiting for the perfect day to publish it here on the Buzz. 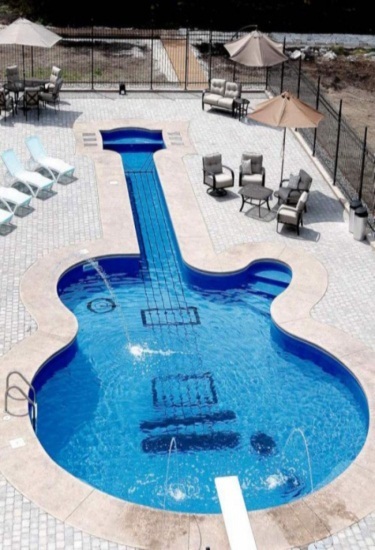 This amazing swimming pool is shaped like a Les Paul guitar and was designed and built by the Canadian pool company, Aqua-Tech. As the story goes, a passionate (and anonymous) guitar collector walked into their office looking for a company that could design a guitar-shaped swimming pool for his backyard. Aqua-Tech presented him with an exact replica of a Les Paul Custom guitar! Measuring 19 meters long, the inspiring swimming pool is very unique – perhaps the only one of it’s kind in the entire world! 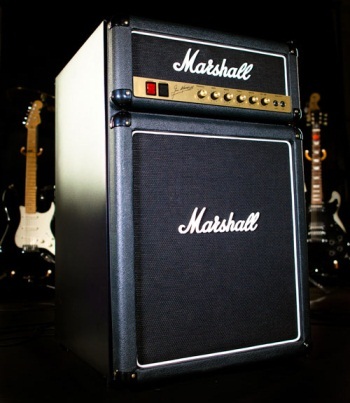 Marshall Amps just got a whole lot cooler! Introducing the brand new Marshall Fridge! The Marshall Fridge “Web Store” will be opening soon. According to the site, they are busy preparing to take (what is likely to be) an onslaught of orders very soon at the special introductory price of $299.00 USD. The estimated ship date for the product is October 01, 2012. I gotta say, this is one of the COOLEST things I have EVER seen! I am in line for mine! Guitar players are a very unique breed. Yes we are! So… what is “THE SECRET ROOM? 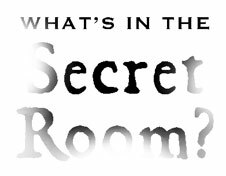 The Secret Room is a website where players will have access to a vast repository of tips, tricks, and techniques — the kind of “secrets” that some musicians jealously protect. But before being admitted to this password-protected site, visitors must contribute one of their own tone secrets — the kind of hard-won musical wisdom that is almost too good to share. Once players submit a secret, they get access to all the other exclusive secrets. They can also comment on the secrets and rate them. NEW YORK (AP) – An instrumental piece of rock and roll history is going public. Fender Musical Instruments Corp., the maker of legendary guitars strummed by the likes of Buddy Holly, Jimi Hendrix and Eric Clapton, filed papers Thursday for a $200 million initial public offering. 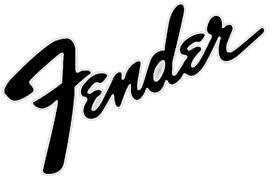 Founded in 1946 by Leo Fender, the company created the Telecaster and Stratocaster guitars in the 1950s. The “Strat,” a favorite of Hendrix and scores of others, went on sale in 1954. It had a sturdy, all-wood body that could stand up to repeated abuse, making it popular in the rock and roll world. “The Fender brand in particular is closely associated with the birth of rock `n roll and has a strong legacy in music and in popular culture,” the company said in a filing with the Securities and Exchange Commission. In its filing with the SEC, Fender said it’s the country’s biggest seller of electric, acoustic and bass guitars. It also makes amplifiers and other instruments including banjos, ukuleles and mandolins, and sells instruments under other brands such as Squier, Jackson, Guild, Ovation and Latin Percussion. The classic Strat and Telecaster models are still made today, with prices ranging from a couple hundred dollars for a basic model to several thousand dollars for high-end and custom versions. Fender went through several owners before making its push to the public markets. In 1965, Leo Fender sold the company to broadcaster CBS Inc., which sold it to an investor group 20 years later. Private equity firm Weston Presidio now owns 43 percent of Fender. Fender’s distributor in Japan, Yamano Music, holds the No. 2 stake with 14 percent of the company. Launching the IPO will help Fender pay down its debt load of $246.2 million. Fender said it plans to use about $100 million of the IPO’s proceeds to repay debt, with money left over for working capital. With sales in 85 countries, Fender said revenue could get a boost from growing interest in guitar-based music from emerging markets like China, India and Indonesia. But it warned that increasing popularity of other types of music, such as rap or house, could hurt demand for its guitars. Guitars and amps make up nearly three-quarters of its sales. In recent years, the Scottsdale, Arizona-based company’s guitars have been used by musicians from Bruno Mars to Shakira. The company plans to trade the shares under the “FNDR” symbol on the Nasdaq, but didn’t say when. It did not lay out how many shares the company and its shareholders intend to sell or set a price target on its stock. The final offering may differ from the $200 million in Thursday’s filing as the IPO’s bankers gauge investor demand for Fender shares. With the overall stock market now trending up, the conditions for an IPO are improving and investors are looking upon the offerings more favorably. In recent weeks, several companies, mostly in the technology and Internet sector, have made splashes in their Wall Street debuts. Fender said it posted net income attributable to common stockholders of $3.2 million in 2011, from a net loss of $17.3 million the year before. Revenue grew 13 percent to $700.6 million from $617.8 million. J.P. Morgan and William Blair are managing the IPO. 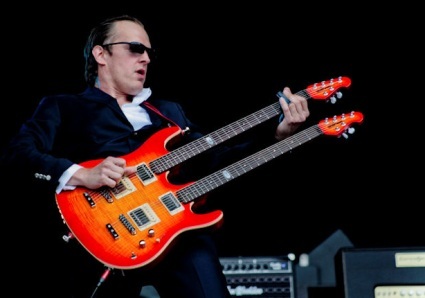 Joe Bonamassa “Blast From the Past”… Bloodline on Conan! Joe Bonamassa posted this “Blast From the Past” video on his YouTube channel. Check out Joe before he was “Joe”… when he was the lead guitarist for the band Bloodline.